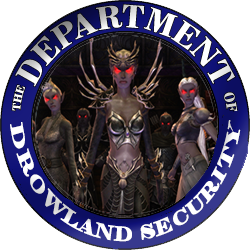 Department of Drowland Security applying for Membership into the Fellowship! Fellowship Leaders, we have a new PUBLIC section here which will allow interested guild leaders to converse about joining the Fellowship alliance. ANY current Fellowship member guild leader or officer is invited to ask or answer the prospective guild representative questions, and participate in ensuing banter. The goal of course is to discover if it would be a good fit for the prospective guild and for us as well. First off is Zeboim from the "Department of Drowland Security". Haha guild name gets a thumbs up already from me! Zeboin informed me that they are a small 8 member guild looking to expand. Zeboin states in his app that they are "somewhat semi-casual." Their sole rule to join is to be a friendly player. Thank you Zeboin for accepting my offer to inquire about joining the Fellowship. We are a private set of guilds here on Ghallanda that have agreed to standards of play that are beneficial to all of our members. Who can't use friendly players that love DDO and playing together in their parties ;) That is what the Fellowship is all about. So my opening question involves zerging. Zerging is off course the Leroy Jenkins style of play ;) Running off and doing your own thing, regardless what the party members are doing. Awesome video but not what we are about. When running in the Fellowship groups, its expected that the party rund at the speed of the slowest player, and never leaves a Fellowship member behind. We stay together unless the party or raid leader has a plan, or one is agreed upon with party members that suggests differently. Teamwork is of course the name of the game as we feel this is the greatest way to teach newer mates how the game is played and how to better perfect all of our player skill and enjoyment of DDO. I am still learning about the game even though I played for a long time off and on. Premium member, until recently became VIP. My First character was a healer so people that ran off made healing difficult and in general is a bad idea, gets you and or can wipe the party. I tend to keep an eye on the map to make sure party is with me and if not will wait or go back for them if it does happen. But my characters except my recent warlock couldn't zerg hard content if they wanted to. As far as guild members are concerned my main Officer Ampstrom was very excited about the rules. Once officially accepted, It will be required guild members will be required to abide by the rules as their conduct represents the Guild and fellowship and not just themselves. Im really liking the sound of this. Hi Zeboim and friends, welcome! Sounds like The Fellowship is a perfect fit for your guild. We host regular epic raids 3 or 4 nights a week which you would be welcome to join. We hold to fellowship rules on these raids which make it perfect for first-timers - these are always welcomed by the whole group and made to feel comfortable and valued. For those already familiar with the raids all we ask is that you stay with the group and work as a team. Hope to see you in chat soon. Sounds like a good fit. I've been a long time member & both learned & helped many others. Hey, look. Howard's being eaten. Zeboim, I'd like to officially welcome you and the Department of Drowland Security to the FELLOWSHIP!! Awesome, I love it. I will need to learn how to use it.